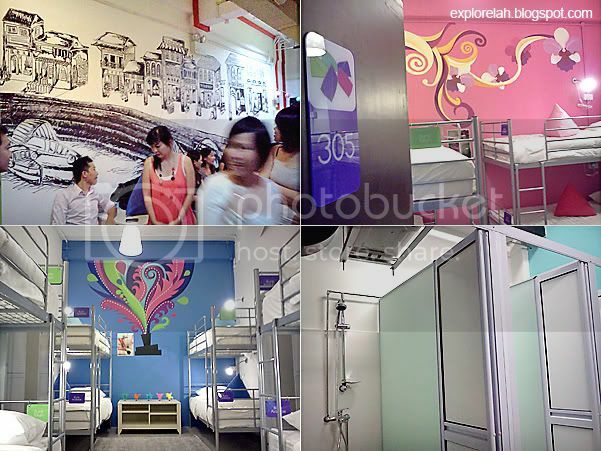 It's playtime in the Lion City with Five Stones Hostel... a brand new backpacker's lodge at the heart of downtown Singapore! Promising to offer an "immersive backpacking" experience that goes beyond just a good night's sleep, the hostel seems poised to be the most interesting budget accomodation for travellers to our tiny red dot. 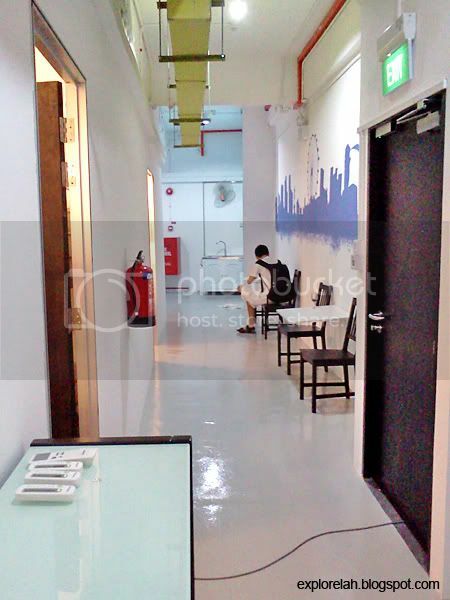 Five Stones Hostel is located within the prime historic and commercial district of Singapore. Address : 61, South Bridge Road. I had the delight of being invited to preview this quaint hostel and I must say that if I'm a foreigner visiting Singapore, Five Stones Hostel would definitely be my top choice to stay in. Sitting along one of Singapore's arterial roads that links the past with the present, FSH calls as its neighbours, some of the key heritage and metropolitan developments of Singapore. Just a (five) stone's throw away is the historic Singapore River where the story of our nation's prosperity started; Clarke Quay and Boat Quay which together, form a seamless F&B and entertainment arc by the waterfront; Singapore's main financial hub, the Central Business District (CBD); Central Shopping Mall, Funan IT Mall, Fort Canning Hill, and many more tourists attractions that are within a walking radius of the hostel. FSH will officially open its doors for business on 15 Oct 2011. I heard that the hostel is already almost fully booked ahead of its launch! Pictured here is the Peranakan bunk which features an artistic impression of Singapore's Straits-born Chinese community. 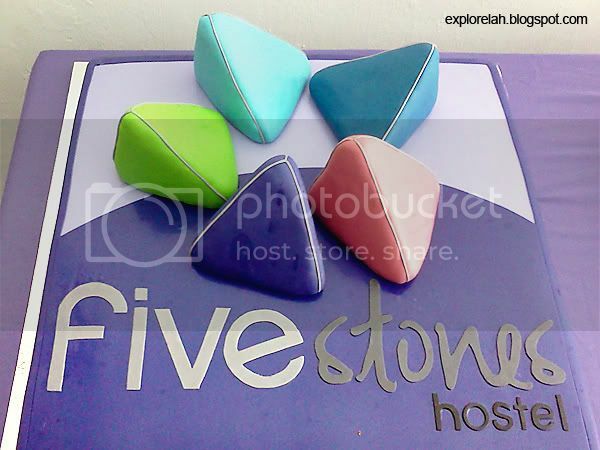 If you do not know what 'five stones' is, it's a traditional game that the older generation of Singaporeans play. I grew up with that game. And also hopscotch, goli (marbles), zero-point, police-and-thief, one-leg, bottle caps or erasers battle, pick up sticks, blowing gel and soap bubbles, paper planes... a time where our whole body is the game console. And some of these games and cultural influences form the themes of bunks and private rooms at FSH. I really like how the hostel is named after a game that invoked so much nostalgia and fond childhood memories in me. Gosh, I'm old! So any tourist staying here would be like living amongst things close to the hearts of older Singaporeans. The bunks and rooms come with good quality orthopaedic mattresses that are also anti-dustmites. I had a test of the bed. Springy and comfortable indeed. The bed is just right for my average Asian size. 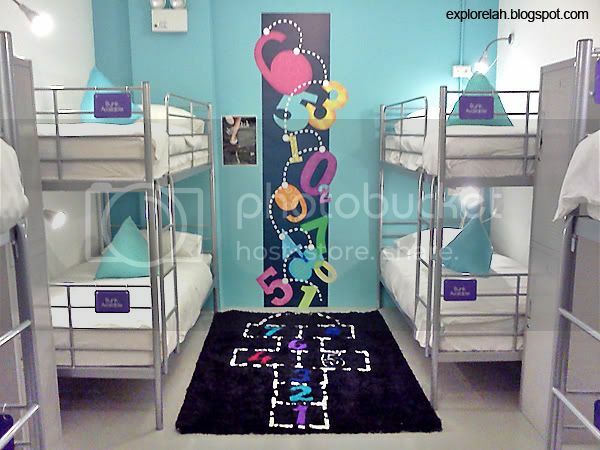 A game of congkak awaits while a miniature trishaw welcomes guests to bunks with the respective themes. All done to give visitors to Singapore an intimate encounter on top of the sights, sounds and cuisines. Hopscotch bunk with a game carpet made by the owners. All the bunks and rooms come with little posters that explain the themes, their significance to Singapore, and for games, how to play them. That's really thoughtful. So which playroom do you want to book? Guests can befriend and share travel stories at common areas such as the corridor featuring a mural of early Singapore. Bunk 305 is a female-only bunk while the others are mixed. View of the common wash area and showers. There are also washing machines for laundry. View of a common area featuring a wall mural of modern-day Singapore's skyline. This is TZ in one of FSH's private rooms with a gasing (top spinning game) design. He is the graphic artist behind the colourful and abstract adaptations of games and cultural elements in the thematic bunks and rooms. He wanted to inject a young energy into these traditional icons of Singapore. The result is a splash of hip culture-chic on the walls of FSH. Alrighty, that's Five Stones Hostel for you. Please pardon the quality of the photos as my Canon compact camera 'drowned' during my recent trip to Langkawi and went kaput. I was heading to another party after FSH's soft launch event so I didn't bring along my Nikon DSLR so the shots were taken with my phone's camera. 1) Central Location - I am a local. So trust me on this. The location is one of the best for a backpack hostel. It is just a block away from Clarke Quay MRT Station and a fleet of buses link it to the rest of Singapore. 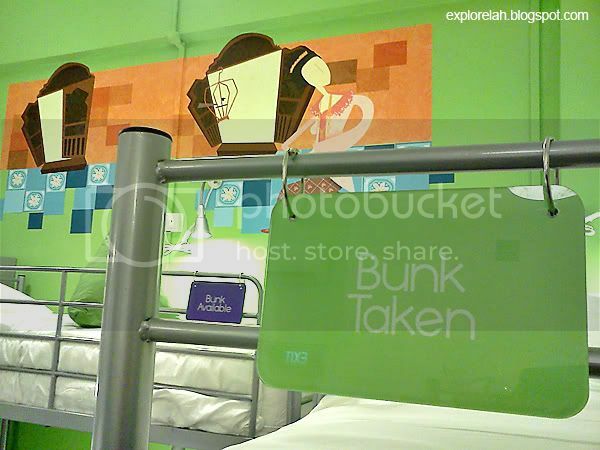 2) Good Value-for-Money - A bunk bed costs between S$30 - S$35 and a private room costs S$90 a night. And the hostel has tie-ups with merchants around its vicinity for special promotions and discounted prices on products and services for guests. Breakfast included during stays. 3) Great Ambience - The place is clean, neat, bright and cheerful. A refreshing image for budget stays which are very susceptible to poor design and neglect in upkeeping. 4) Top-Grade Orthopaedic Mattresses - Budget accomodation doesn't need to be a compromise in comfort. 5) Free Wi-Fi - Unlimited free access is available in all bunks and rooms. This is really great when compared to most hotels that only offer access only at the lobbies. So you can just lie in bed and get your daily fix of Facebook. 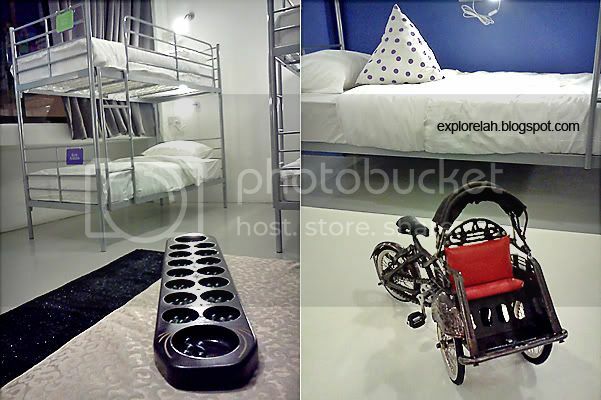 Five Stones Hostel will definitely rock the backpacking scene in Singapore! Hi , I wanted to know if the private rooms are spacious ! Cause looking at the picture they seem very small . Thank you . And also how many bathrooms do they have ..
hey karan... yes, the private rooms aren't very big. with a queen-sized bed and a flatscreen TV at the foot of the bed, there's just enough room for lugguages and little space to move around. FSH occupies 2 levels of a 6 storey building. 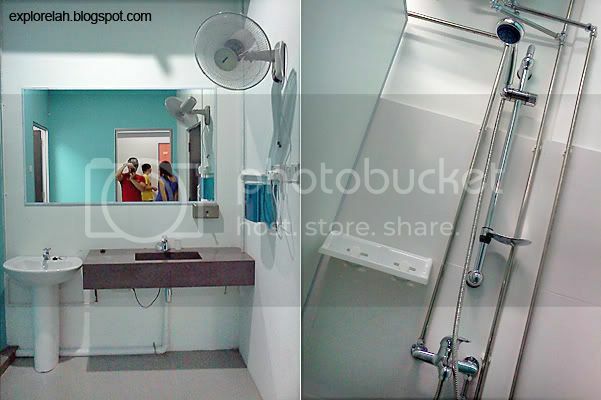 there are a total of 4 toilets and 5 shower cubicles shared on the 2 floors. Hi Darren! 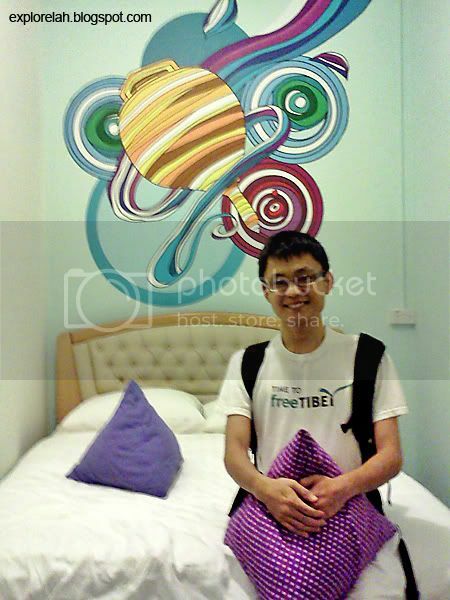 I'm Ting Zhao, the designer for the rooms' mural...remember me? lol. Hey, this is a very thorough review you have! And i also enjoyed reading your reviews on other places...will keep these places in mind for my next holiday! it was good to meet u at the FSH's launch party last Fri! Keep in touch! ah... them ikea bunk beds. i know over time they're gonna get 'creaky' but that's alright - i think it'll remind me of my late teen years. hahaha. that would definitely make me feel more at home! thanks for the thorough review of the FSH, you just earned yourself another follower for your blog (malaysian some more lah!) i'll be visiting singapore for my first backpacking experience. definitely will try to get a hold of one of them bunks!